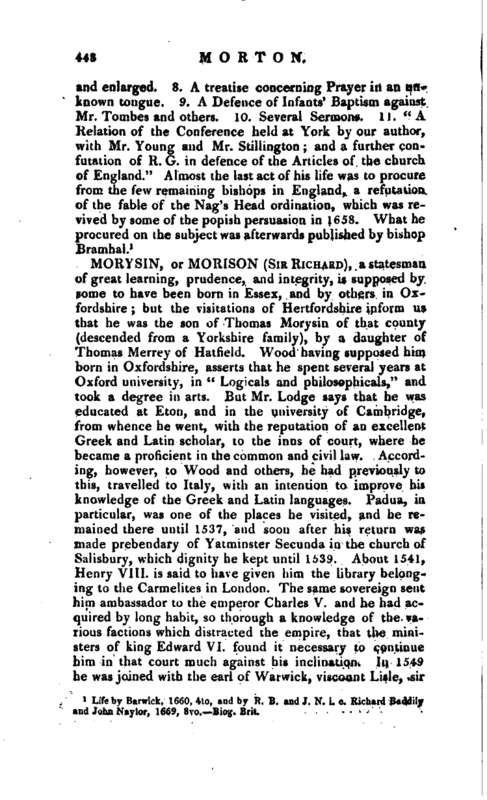 , a statesman of great learning, prudence, and integrity, is supposed by some to have been born in Essex, and by others in Oxfordshire; but the visitations of Hertfordshire inform us that he was the son of Thomas Morysin of that county (descended from a Yorkshire family), by a daughter of Thomas Merrey of Hatfield. Wood having supposed him born in Oxfordshire, asserts that he spent several years at Oxford university, in “Log;cals and philosophical,” and took a degree in arts. But Mr. Lodge says that he was educated at Eton, and in the university of Cambridge, from whence he went, with the reputation of an excellent Greek and Latin scholar, to the inns of court, where he became a proficient in the common and civil law. 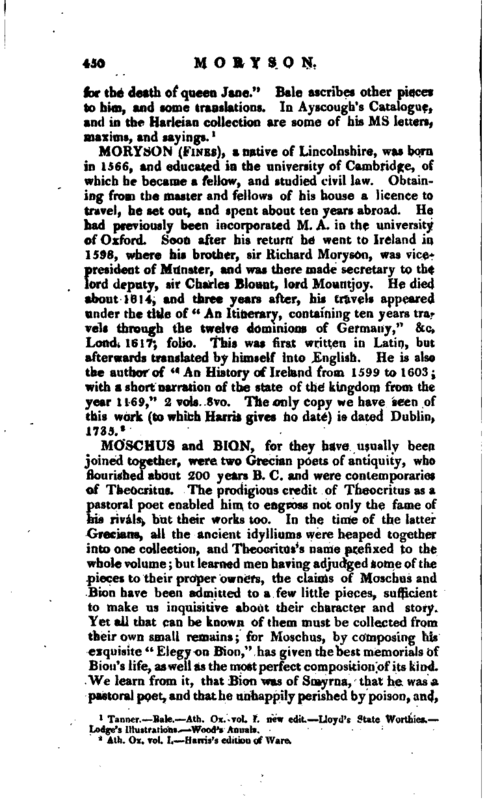 According, however, to Wood and others, he had previously to this, travelled to Italy, with an intention to improve his knowledge of the Greek and Latin languages. Padua, in particular, was one of the places he visited, and he remained there until 1537, and soon after his return was made prebendary of Yatminster Secunda in the church of Salisbury, which dignity he kept until 1539. About 1541, Henry VI 11. is said to have given him the library belonging to the Carmelites in London. The same sovereign sent him ambassador to the emperor Charles V. and he had acquired by long habit, so thorough a knowledge of the various factions which distracted the empire, that the ministers of king Edward VI. found it necessary to continue him in that court much against his inclination. In 1549 he was joined with the earl of Warwick, viscount Lisle, sir | William Paget, sir William Petre, bishops Holbeach and Hethe, and other personages, in a commission to hold visitation at Oxford, in order to promote the reformation, and their commission also extended to the chapel of Windsor and Winchester college. The celebrated Peter Martyr preached before them, on their entering on business, and was much noticed and patronized by Morysin. From Edward VI. he received the honour of knighthood, and appears to have gone again abroad, as Mr. Lodge gives us a long letter from him relating to the affairs of the imperial court, dated Brussels, Feb. 20, 1553. He returned not long before that prince’s death, and was employed in building a superb mansion at Cashiobury, in Hertfordshire, a manor which had been granted to him by Henry VIIL when queen Mary’s violent measures against the protestants compelled him to quit England, and after residing a short time in Italy, he returned to Strasburgh, and died there, March 17, 1556. 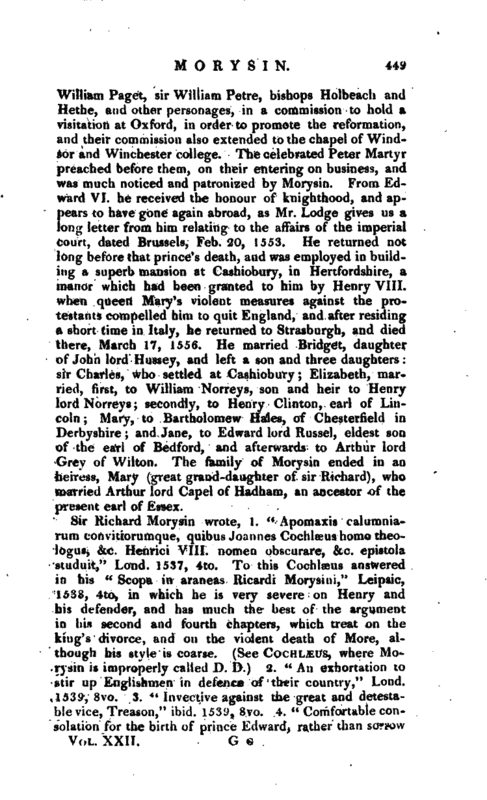 He married Bridget, daughter of John lord Hussey, and left a son and three daughters sir Charles, who settled at Cashiobury Elizabeth, married, first, to William Norreys, son and heir to Henry lordNorreys; secondly, to Henry Clinton, earl of Lincoln Mary, to Bartholomew Hales, of Chesterfield in Derbyshire and Jane, to Edward lord Russel, eldest son of the earl of Bedford, and afterwards to Arthur lord Grey of Wilton. The family of Morysin ended in an heiress, Mary (great grand-daughter of sir Richard), who married Arthur lord Capel of Hadham, an ancestor of the present earl of Essex. 1538, 4to, in which he is very severe on Henry and his defender, and has much the best of the argument in his second and fourth chapters, which treat on tlje king’s divorce, and on the violent death of More, although his style is coarse. (See Cochlæus, where Morysin is improperly called D. D.) 2. “An exhortation to stir up Englishmen in defence of their country,” Lond.